One of my fantasies was to publish an anthology of my short stories. The number of short stories grew so vast, I decided to break my Twisted Tales into several. My fantasy is a fantasy no longer. 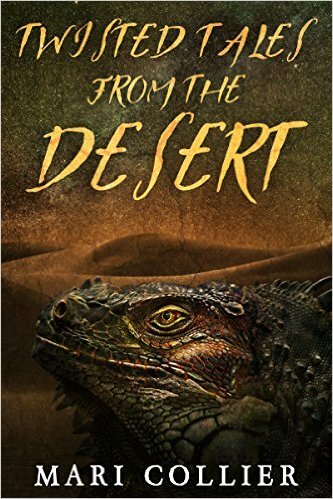 Twisted Tales From The Desert is now available. Have a look! You'll enjoy what you read. Now you can download Retail Wedding and Once A Frog Always A Frog at Smashwords. Retail Wedding takes you into the future. Weddings have evolved. This will take you to the shopping event of any couple's dream wedding. It's a ceremony of bonding for the best bargain. Once A Frog Always A Frog - In a fairy tale, a kiss from a beautiful girl will turn a frog into a handsome prince. To find out if this holds true in rural America, follow Elvie Fedderman as she discovers why the farming community of Austin, Iowa is overrun with frogs. The Bullocks have always been a contentious, strong minded lot. In 1534, Margaret Bullock went to the stake rather than become a Protestant. In 1554 under Bloody Mary’s reign, Thomas Bullock went to the flames rather than become Catholic. Their attitudes began to shrink the family lines, and during the religious wars against King Charles in 1641 and 1647, the Colonies became extremely appealing to the remaining Bullocks. “We are sailing to Massachusetts where religion is practiced in purity,” their patriarch Silas Bullock announced. And so the family sailed to Massachusetts. Six years later the patriarch’s righteous contentious ways so angered the good people of Massachusetts they packed him and his family off to Rhode Island to join the other dissenters. It was without the fanfare of a Roger Williams or an Anne Hutchinson as the Bullocks weren’t interested in converting others. It was their ability for adamant statements while disputing theology with their betters that became their undoing. Rhode Island proved to be a refuge until the Revolutionary War when the Bullocks split the entire clan over whether they were Tories or true, freedom, independence minded Americans. After the war, the greater portion of them moved westward, and began to flirt with spiritualism in one manner or another. A little more than a century after the Revolutionary War, Trevor Bullock sat in the lecture hall, the smell of wet and drying woolens fading as his mind became enthralled with Madame Blavatsky and her Theosophical Society. His wife, Madeline, kept fidgeting and looking at the doorway. Why couldn’t she understand the concept of the universal brotherhood of humanity? Madeline, of course, was not a true Bullock, but a cousin twice removed. Since Trevor enjoyed his cigar and brandy after dinner, he ignored her. Divorce was not a simple procedure in 1889. Madeline, being a “good” wife continued to have his children: ten of them to replenish the Bullock line. Most became staunch Methodists or Baptist, except for Trevor as he increasingly relied on brandy. Perhaps it was the ten children that drove him to drink. Their religious fervor gradually faded into secularism, but they continually upheld their family tradition by being in the forefront of the latest cause whether it was voting rights for women, building bomb shelters, or protesting the war in Vietnam. In our age the youngest became enthralled with the desire for perpetual youth. Matthew Aaron Bullock was six-years-old when his great-aunt Matilda passed away at the age of ninety. Matthew was devastated for Aunt Matilda lived next door and always provided him with cookies and a safe haven from whatever catastrophe intruded upon his small world. “Because she wanted to rest,” fudged his mother as she did not believe in heaven or hell. “Sometimes people need more rest,” was the vague answer. The, “Because it was her time,” assurance of his father left Matthew confused about the concept of time. Aunt Matilda’s ancient dog, Lightning, so named in his younger days, became Matthew’s constant companion while he watched television. “It’s the least we can do for Aunt Matilda,” said his mother over his father’s objection to a dog in the house, and all returned to normal for almost a year until Lightning expired. “No, I won’t. I won’t!” The stubborn, red Bullock flush spread over Matthew’s face. The years passed, and true to his word Matthew did not grow older. This caused a certain amount of medical tests, probes, counseling series, and worry for Matthew’s parents. Matthew remained oblivious to his parent’s pleas. He was quite happy with toys, whether they were organic, plastic, or mechanical. Schooling became a very real quandary. Since he did not physically mature, neither did his emotions or intellect. He remained forever in first or second grade (depending upon the school system in whatever town they lived) as he was unable to grasp the more complex concepts of social interaction or higher mathematics. His parents were left with the choice of moving every two or three years or keeping him at home. Their latest refuge was the high desert where people are more forgiving of human quirks. “What will happen to you when we grow too old to take care of you?” wailed his mother. Matthew smiled happily. “I can live with Benny, and we can play all day long.” Benny was his current next door neighbor. “Yeah, look what I have!” Benny showed Matthew a handheld game where adorable looking little monsters were busy dispatching each other at the commands of their trainers by employing fire, electric bolts, rocks dropping out of the sky, water, and strange spells that froze the opponent while the rival happily dispatched them. “If you get one too, we can trade our fighters by holding our games close together. See.” Benny showed Matthew an infra-red port. Neither child comprehended the meaning; they simply believed that the game would function as promised. For some reason Matthew’s parents purchased the electronic devise and game for Matthew. He spent hours of enraptured game play, building his monsters to their highest levels, looking for the hidden, more powerful monsters in the game, and completely forgetting time or time of day until his mother would rudely pull the game away. Long wails of protests would greet her ears and finally, she would relent and allow him to save his game. Matthew, of course, stubbornly spent all his time thinking of new ways to play the game. Once the game was in his hands, he would run and hide to play happily for hours. His parents were incensed every time Matthew talked about his game until they noticed Matthew had outgrown his shoes, his slacks, and his shirts. His mother (not being a Bullock) started to praise him. Before she could say more, her husband interrupted. “No, my dear, you are wrong. He’s still the same. Everything today is of such poor quality that the material shrunk.” He hustled her out of the room. This bit of prognosticating proved to be true. Matthew didn’t realize how his parents misled him even when he entered college where he enrolled in biology and chemical engineering with the goal of finding the gene to eternal youth. You’ll find him on television soon. He’ll be lecturing on maintaining perpetual youth.